Soft Yellow and White and lasts for four weeks. This is the final week of my month as visiting artist there and I’ve really enjoyed being challenged with things I wouldn’t normally do. This week’s colours are no exception. I don’t use any shade of yellow on its own very often at all, although I often use it with other colours because I think it pulls them together so well. I know the Once in a Blue Moon challenge was for Thank you notes and has only just ended, but we can’t have too many of those after Christmas when we have so many people to thank and so many things to be thankful for. 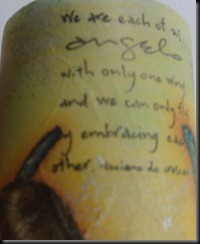 You’ll have to click to enlarge to see the detail, but I’ve taken some close up photos, too, to show the embossed bits. 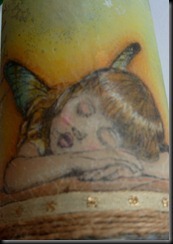 I love the soft look of Versamagic inks and they are always my first choice for pastel colours. 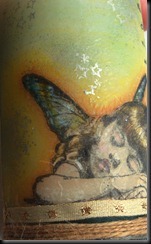 They have the added bonus of being permanent, stamping on most surfaces (including fabrics) and embossing really well. The base was sponged randomly with Thatched Straw – Versamagic doesn’t stipple well, but it sponges beautifully if your inkpad is nice and moist, so it’s worth having reinkers. 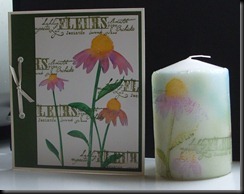 The Hero Arts Thanks stamp is stamped down the right hand side, in the same ink, followed by the background flowers (Innovative Stamp Creations) to the left, heat setting to seal. Then, inking only random sections of the same stamp, I overstamped a few times with Versamark, followed by stamping the two flowers for the foreground and embossing with White detail EP. It’s hard to pick that out and even more difficult when trying to photograph, so I took a couple of close ups. To finish, I edged with Ranger Lemonade dabber, matted onto white, then onto two Fleur de lis Nestie squares, offset to top and bottom corners. Before attaching it to the pale lemon card (Bazzill) I white embossed the Thank you stamp in opposite corners of the card and edged the whole thing with pearl acrylic paint. 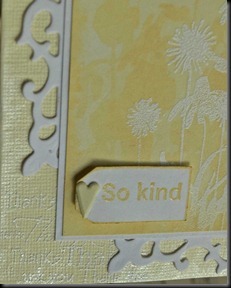 I finished off by stamping and clear embossing ‘So Kind’ in Thatched Straw on white, punching out a small tag and edging with ink before attaching to the front with a pale lemon heart brad. Thank you VERY MUCH to the Gingersnappers for inviting me to share in the fun of the challenges. I really appreciate the honour, having admired the work there for so long. I’ll update this post later today, with the results of the Blog Candy draw and show/tell you what else I’ll be adding to the parcel! When I saw wax as the theme for this I went into serious panic mode. Anyone who knows me, knows I HATE wax collage – I’ve tried it, am BAD at it and just hated working with it, although I love other people’s creations. So I had to approach this from a different angle and here’s what I ended up with. I’ve had this candle stamp for years – bought it from someone who, as far as I know, is no longer in business, but I love it. 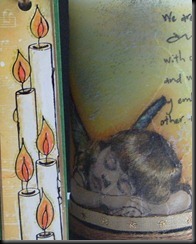 I stamped it on glossy card, using Stazon ink and then coloured the candles with a small, sharpened candle, to create a wax resist effect. I then overstamped with Versamark before sponging various Adirondack green inks over, creating a second resist effect. Once I’d wiped off the wax, I added some shading with Tombow felt tips. 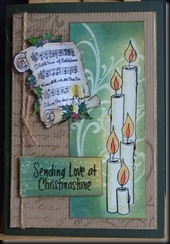 The music and candle card is one of my oldest (and favourite) stamps from Embossing Arts and after shading with Tombows I used Sepia accents to age it a bit more. 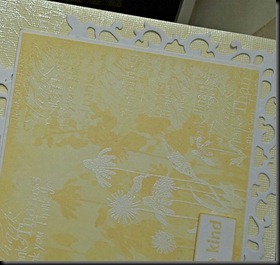 The Kraft card (Woodware) is stamped with Versamark ink, to give a bit of depth under the layers. 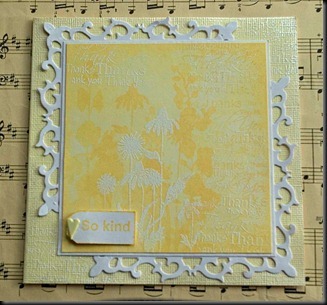 All layers (including card) are edged with gold Krylon pen. The gift card is a Scrapling, one of my favourite things to make and perfect for gift tags. Whenever you make a card which isn’t quite A5/A6, you’ll have a strip of folded card left (if you fold first, as I do) and that ‘scrap’ is perfect for a little accompanying card. The candle was white. I stamped the angels (Beeswax stamps, he, he) on tissue paper, coloured them with Prismacolor pencils, adding some colour for the background, then stippling a bit of ink to add more colour before stamping the text. 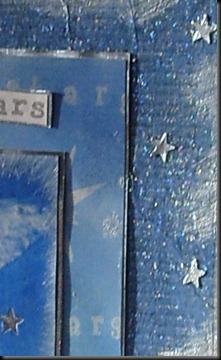 The silver stars are stamped in Silver Stazon ink. It’s wrapped with hemp and the candle itself has been finished with a special candle painting medium to make it anti flammable, although I would still recommend burning only a couple of inches, then placing a tea light inside the shell to preserve the decoration. … then one using flowers. I’ll probably end up making more of these now that I’ve ‘got my feet wet’ so to speak. You can see the fab design team’s inspirational works of art over at Gingersnaps. I was thrilled to be invited to be ‘Visiting Artist’ over at Gingersnaps for December – a great honour – thank you for asking me. December isn’t my most creative month, I have to admit – I tend to concentrate on simple Christmas cards, with the odd gift thrown in for good measure, but I tried to fit this in with this month’s challenges. 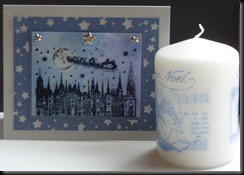 For the month of December, the theme is Holiday lights and the first ‘theme’ challenge is ‘Starry Nights’. I love starry skies and so decided to make a calendar for this one. The ‘mountboard’ was made by stamping silver stars on a mid blue tissue paper, using acrylic silver paint and an old freeby foam stamp I had knocking around, then crinkling when dry, to create a bit of texture. Using gel medium, I attached this to a larger piece of very heavy, slightly corrugated mid blue card, edging with more roughly applied silver acrylic paint and finishing with a glitter glaze, which gives a bit of a sparkle but not too much. It’s hard to photograph glitter and especially when the weather’s grey. 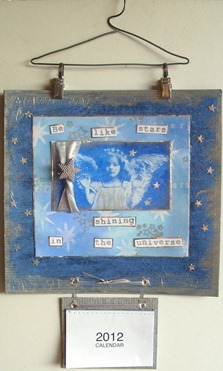 The image (Bella Rosa) was stamped on glossy card, using Stazon Azure ink. I cut around the image, then punched the odd star out of the sky and attached to a slightly larger piece of silver mirror card, tying a piece of sliver ribbon around one edge, threading through a silver diamante star button. 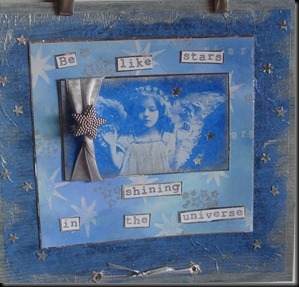 This was attached to a glossy resist background, which was first stamped with Versamark ink, using various star images, then sponged with a few different shades of blue dye ink. 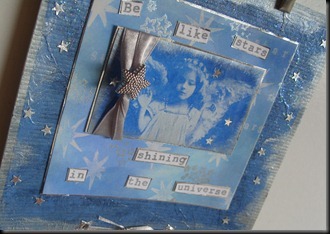 I overstamped a few more stars in Silver Stazon ink, before attaching to more mirror card and then to the mount. The words were computer generated, cut out and attached to mirror card, then randomly placed on the background. 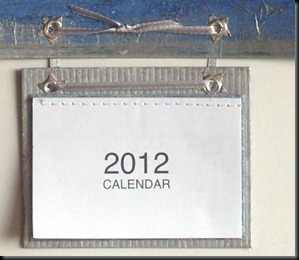 I edged another piece of heavy blue card with acrylic paint, attaching a calendar then put two star eyelets in the top, matching up to another two at the base of the mount. 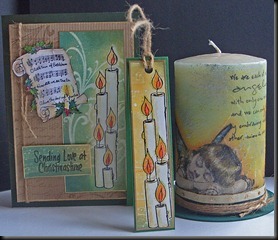 This is attached with narrow silver ribbon. To finish off, I attached a few punched stars, randomly around the edge of the board, then attached a hanger.